Yahoo! seems to have developed a spring in its step now a days. Just days after launching a Yahoo! Weather reloaded for iOS, Yahoo! has updated Yahoo! 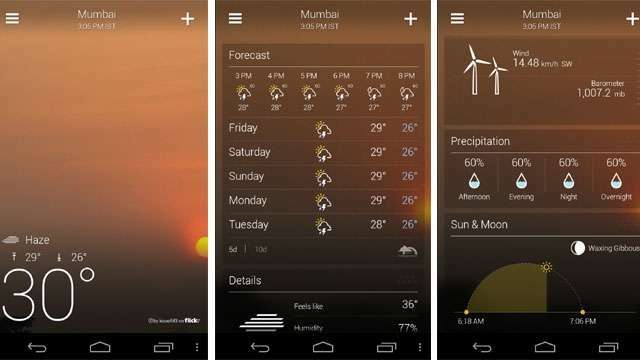 Weather App for Android. Beside the beautiful interface, Yahoo! Weather will now pull images of the city you are currently in from Flickr. You can also see city specific images and weather by tweaking the settings a little bit. In addition to above, the Yahoo! Weather will give you temperature and weather forecasts for forthcoming ten days including hour-by-hour predictions. It will also show you precipitation, wind and pressure, moon phases, UV patterns, as well as sunrise and sunset times. The application also has a personalised map and a widget for your lock screen in tow to make it more accessible. You can download this beautiful App from Google Play now.